After a positive opening campaign in the Elite League, Lightning replaced head coach Pete Russell with Doug McKay prior to the new season. However, Canadian McKay struggled to get a work permit before embarking on the worst losing run the club had ever been on. Since his departure, fortunes have barely changed, and Lightning are rooted to the foot of the table, and have lost 10 games in a row - nearly at the all-time record of 11. 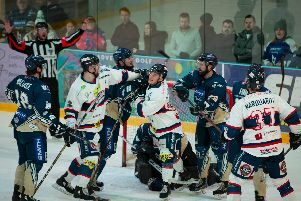 With the play-offs a near-impossibility this year, the Moodys have said they are turning their focus to the 2019-20 season already. In a statement on the Lightning website, they said: "Given the extremely high cost of signing players new to the club at this stage of the season, it would not be the best use of available finances. It would be a more responsible use of funding to focus on strengthening for 2019-20. "Everybody behind the scenes is working harder than ever to make the club a success; it is a huge achievement that last Sunday we had more than 1,600 spectators for the home game against Glasgow. Sunday matches are traditionally less busy, but the fact that this was one of our highest attendances all season so far - makes all of us very proud to have such a supportive and loyal fan base. "The team has played through numerous injuries and illnesses, and the vocal support of our ‘Barmy Army’ fills them with pride and confidence, helping them continue to work to improve. "Ryan Lannon has taken a step back from coaching the team, allowing Tim Wallace to take on the role solely. We thank Ryan for the work he has put in and his continued help within the team. "We have been very impressed with the work Tim has put in this season and you will be happy to know discussions are at an advanced stage with him for next season. "We accept that this season has not seen the success any of us hoped for, but we will work hard to put that right, building even more commercial relationships in Milton Keynes and sourcing more sponsorships to see the club strengthening financially. "Milton Keynes Lightning has enormous potential; this club belongs in the Elite League, and there is no doubt our presence is noted and respected."